Many African-American women are beginning to transition from chemically treated hair to natural hair. Finding pretty short hairstyles for black women is important as one of the best ways to help your hair recover from chemical treatments is to cut it short so that all of the chemically treated hair is removed and new, healthy hair is given a chance to grow out. Since there is no way to revert chemically treated hair back to natural hair, women should be aware that the point at which the treated hair and natural hair meet is a weak point that will break away. There are a number of pretty, short hairstyles for black women that help to bring in natural hair quickly and beautifully. Each style can be done in stages as the hair begins to grow out naturally. Hair extensions known as SisterLocks can be started with hair as short as 1 1/2 inches long. These longer extensions give you more hair to style in whatever way you desire. And, if you’re a little concerned about transitioning to natural hair, they can be styled just like normal hair so you can do lots of pretty, short hairstyles for black women with them while you wait for your hair to grow out naturally. Once you’ve got a bit more natural length, try comb twists. Divide your hair into sections, use a little bit of styling gel, and twist your hair up. It can be worn in this style, untouched, for several days, but be aware that leaving it longer than that can cause it to lock. If you want to avoid locks let your hair down again every few days. Another style that you can do with is the crinkle set. 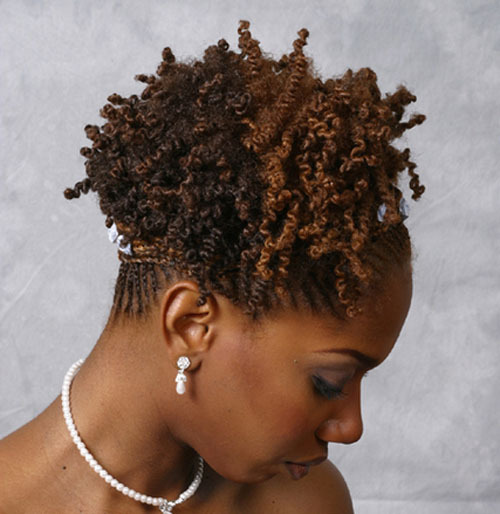 Minimize your hair texture by braiding or twisting your hair with a setting gel. Wear your hair this way for a while, then let the braids or twists out and wear the hair loose and gently styled with the crinkle or twist out look.